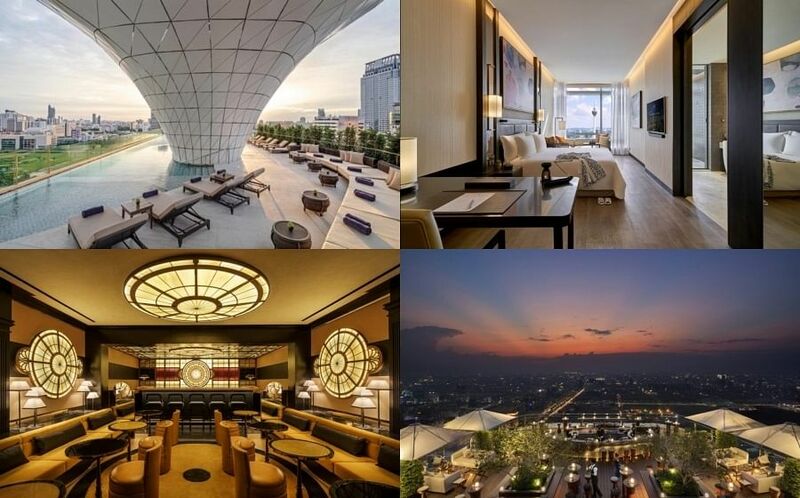 Boasting Singapore’s first saltwater relaxation pool, The Capitol Kempinski is the latest hotel to hit Singapore’s shores, having opened earlier this month in two heritage buildings previously known as Capitol Building and Stamford House, housing 157 rooms and suites. Conveniently located above City Hall MRT next to the Capitol Piazza, the lobby is small and discreet, and is meant make guests feel more at home, rather than in a foreign place. We were greeted by the ever-smiling Carolina Tavares, one of the hotel’s Lady in Red ambassadors. 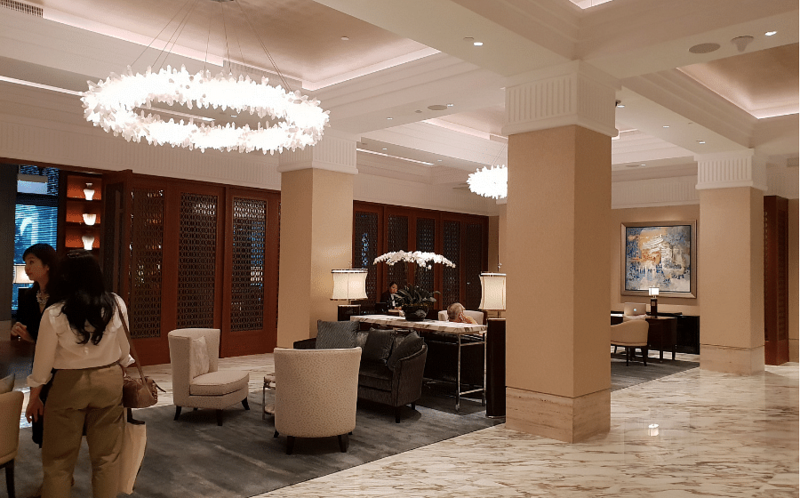 With smooth Italian marble floors, Peranakan pottery, cream armchairs and rosewood furnishings, the lobby reflects the general theme of the hotel, that mixes contemporary design with the buildings’ colonial heritage. We stayed in the Grand Deluxe Room in Stamford House, which has a lovely open space that looks down into the yet-to-be-named restaurant that serves breakfast, which will eventually be run by a mystery chef from a Michelin-starred restaurant once the hotel has its (tentative) grand opening in December. 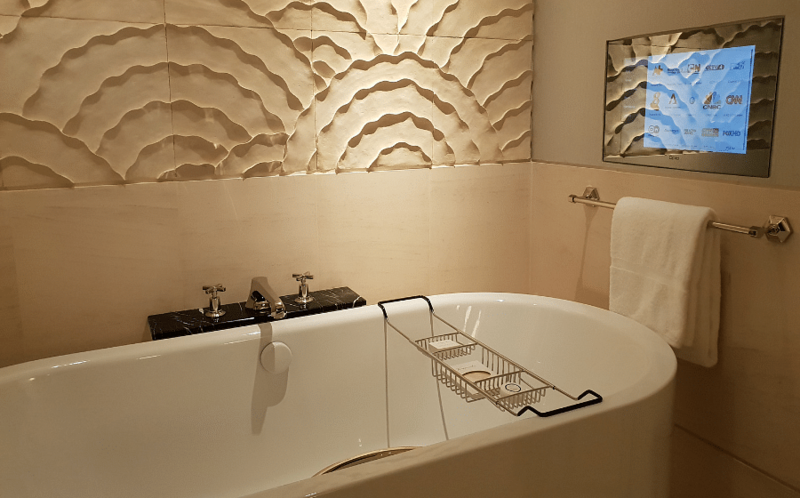 Designed by the late Jaya Ibrahim (once referred to as the “Indonesian Design Guru” by Conde Nast), the room was gorgeous, with a brightly lit marble hallway that runs through what is essentially the bathroom - a smooth white tub and a shower on the left, with two sinks and a toilet to the right. Sliding doors separate these sections from the hallway, allowing for more privacy if you’re staying with someone else. Salvatore Ferragamo’s Tuscan Soul toiletries are on display - we found the citrusy scent a little too masculine and dry. Lovers of Japan’s ingenious toilets won’t be disappointed - we were pleasantly surprised to find the toilet seat heated, in addition to the usual built in bidet and dryer. After a long day of walking around, we took the opportunity to soak in their large bathtub (large enough to fit two, romantic staycay time) and watch TV. 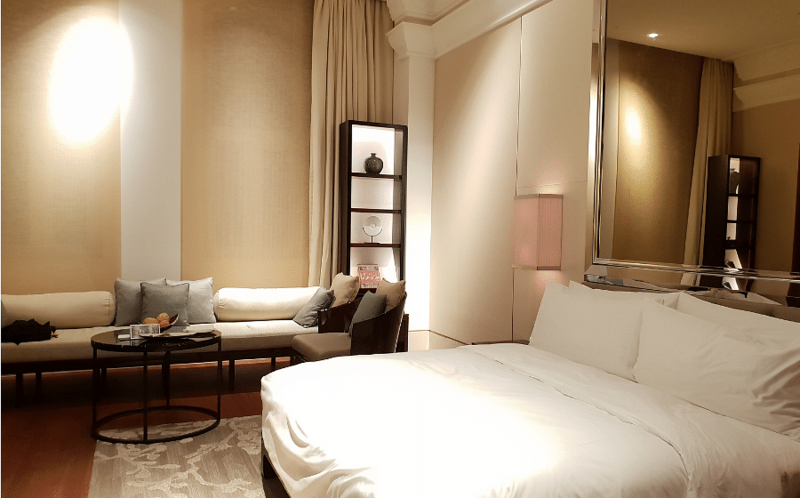 The expansive 55 sqm bedrooms feature a king-sized bed, Nespresso coffee maker, TWG tea, a Smart Led TV, and a plush settee. We loved the little compartment on the rosewood work desk that opens up to reveal a Hollywood-style vanity mirror and the hairdryer - and no shortage of plugs for all your electronic needs. The bed felt like heaven, soft - but not too soft - the fluffy duvet enveloping us as we sank into the mattress. The hotel says you can choose your type of pillow - we didn’t see a pillow menu in the room and so used the ones provided, which were excellent. If you’re worried about hearing noise from the street (given that it’s located in the busy Civic District), the soundproofing is excellent - we heard nothing, and had a great night’s sleep. 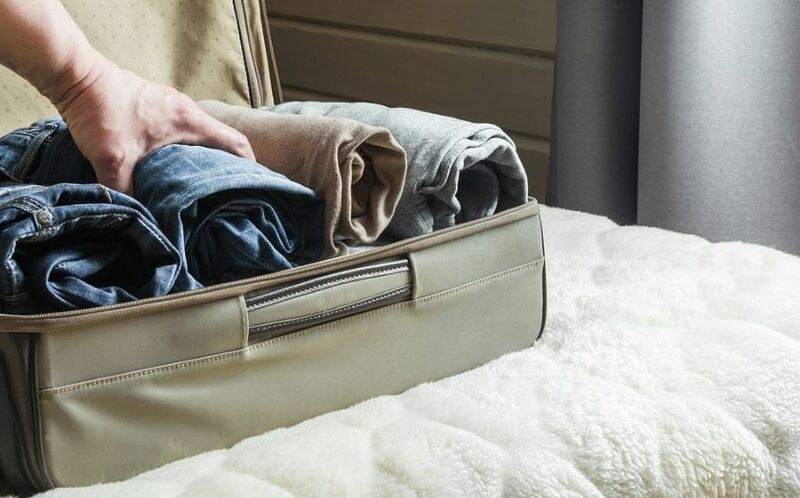 There is no iron nor ironing board in the room although it’s included in the online room description - a quick call to guest services and we had one delivered (laundry services are available at an extra cost). 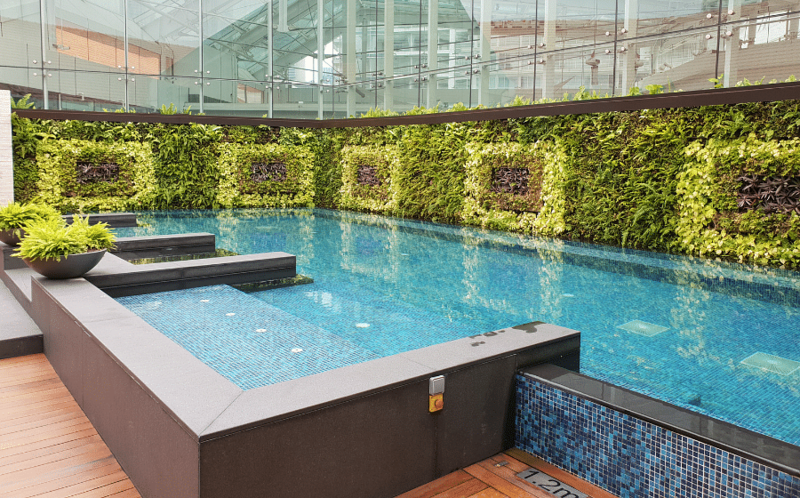 The saltwater relaxation pool sets out to be an oasis of calm within busy Singapore, and is located on the rooftop of the hotel, on the fourth floor next to the spa. A small pool, we reckon perhaps two to three people could do laps at one time (any more would be a squeeze), though it’s best enjoyed sitting in front of the spa jets and gazing at the lush foliage that surrounds three quarters of the pool. We were lucky to have the pool to ourselves, which was mostly quiet apart from the occasional noise coming from Capitol Piazza - the pool faces the malls’ glass roof. The hotel chose to use saltwater as it requires less chlorine, and is much gentler on the eyes and skin - something we agree with. 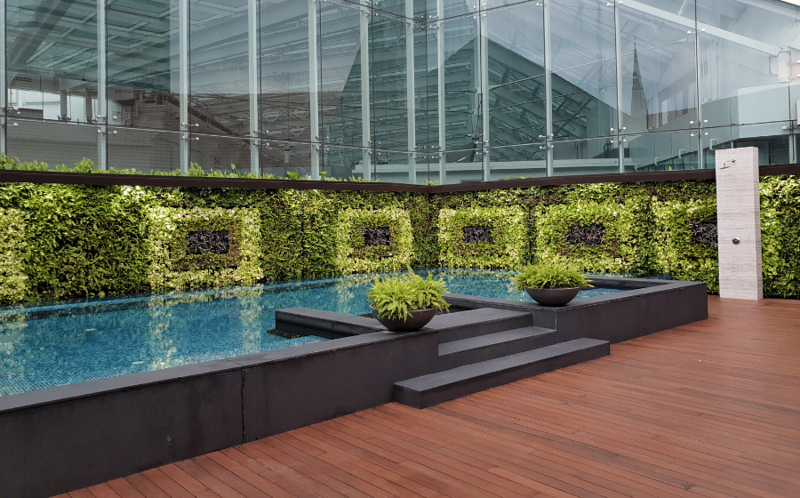 There was none of the irritation or drying of skin that one usually associates with traditional swimming pools, and the stillness of this rooftop space did make us feel as if we were in our own little world. We wanted to try out the spa - their signature Singapore Massage combines three techniques: Chinese tui na for the stomach, Malay abdominal and an Indian foot massage with a Kansu bowl ($240 for 90 mins) - but sadly it’s not in operation yet. Staff say it should be open in December. The spa only has three rooms, located opposite the pool and the 24-hour gym, but in-room treatments will be available. Breakfast is in their beautiful restaurant, the structure of which hasn’t been changed (it is a heritage building after all), with art-deco metal arches adorning the sides, and intimate private nooks for you to enjoy their extensive selection of drinks: Chateau Margaux and the Bulgari family’s Argirio Podernuovo among them. 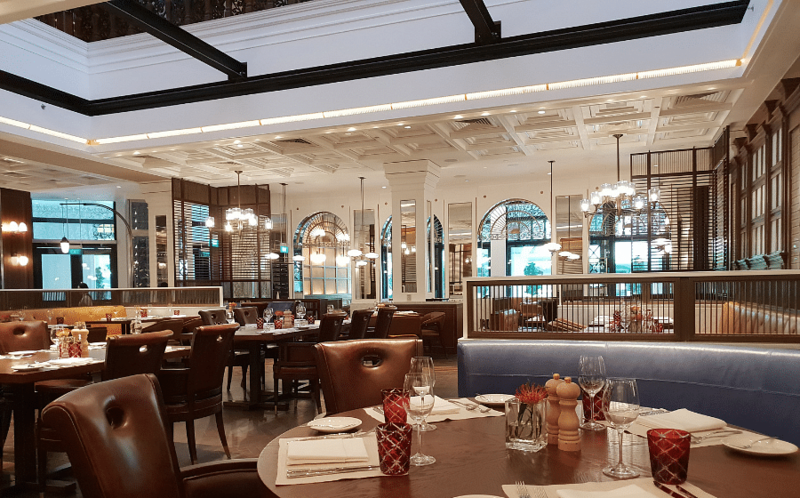 With both buffet and a la carte available (the menu is on an Ipad), we enjoyed a perfectly cooked egg white omelette with our choice of fillings, accompanied by a moreish sundried tomato, grilled asparagus, spinach and smashed avocado, followed by dim sum and cold cuts. Lunch, tea and dinner is served in The Lobby Lounge; we enjoyed a sumptuous four-course meal by executive sous chef Andy Soon (formerly of one Michelin-starred Labyrinth) that started off with fresh Hokkaido scallops topped with farmed caviar and sour plum dressing, followed by our favourite, Roasted Cod with lemongrass and foie gras. The foie gras was mixed into the sauce, and made for one seriously addictive seafood dish. Next was the slow-roasted Australian Beef with seasonal vegetables that had delightful crusted purple potatoes. We ended with the pretty Creme Brulee with coconut and torched gula melaka, biscotti and jam-filled berries. The dessert was a little too heavy, and the green tea ice cream didn’t quite gel with the dish, but the hotel is still finalising their menu for the opening. In between the lobby and the restaurant is the posh Kempinski Boutique, dedicated to rum and chocolate - all of which is for sale. 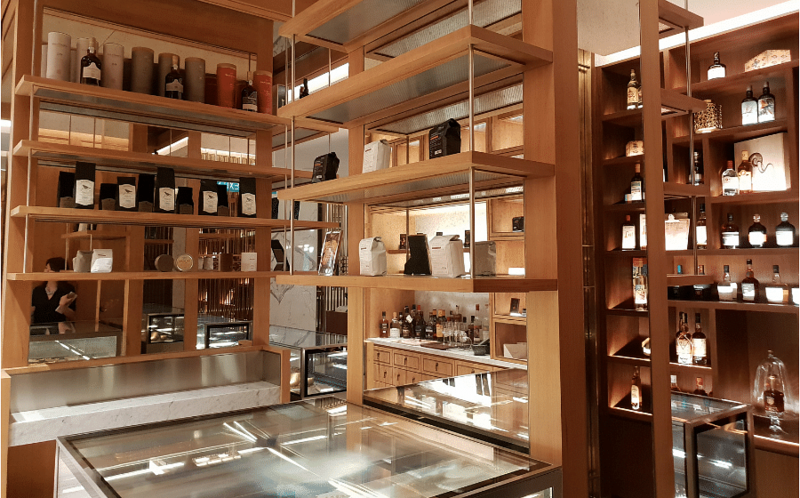 Local artisan chocolate makers Fossa Chocolate are working with Kempinski to create a signature rum-infused chocolate; in the meantime enjoy one of the many flavours on display. The rum follows the voyages of Christopher Columbus, with rum grouped according to country (the hotel takes a little bit of artistic license with Columbus’s route). While we loved our overall stay, a little more signage directing you to the hotel inside Capitol Piazza would be good, as once you emerge from the MRT to the ground floor (next to 1933 by Toast Box) it’s not clear which way the hotel is - a visiting friend got lost and ended up walking around the outside. Taxis and ride-hailing services may also take a while to reach the hotel - there is signage directing them to enter via Hill Street, but if they miss the turn-in they’ll have to do a loop around. The hotel staff are very helpful and prepared for this - one tried to help me call my Grab driver and give them directions, while another stood near the entrance looking out for the car. We expect these are minor teething problems, and that come December, the hotel will be running smoothly.